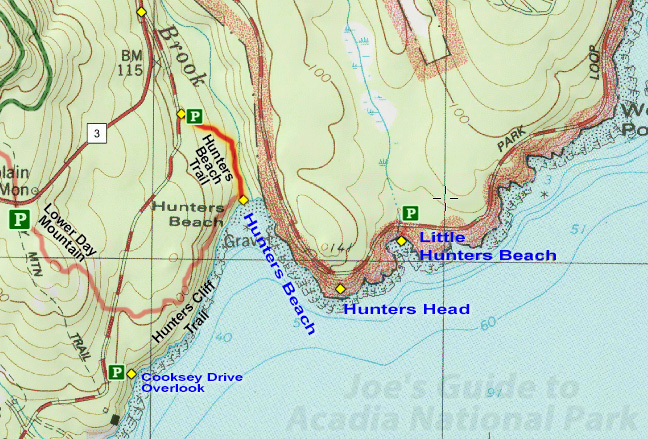 Access: Hunters Beach Trailhead, located on Cooksey Drive near Route 3. To get to the trailhead, drive Route 3 east roughly 1.3 miles from the town of Seal Harbor or west roughly 1.5 miles from the town of Otter Creek to the intersection with Cooksey Drive. The trailhead is located roughly .2 miles down Cooksey Drive on the left (east) side of the road. Parking is limited but overflow parking is available a bit down the road in either direction. Hunters Beach Trail is a fun and easy family stroll. 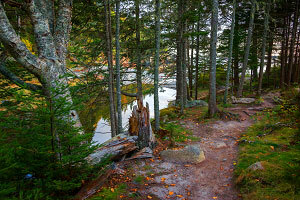 The trail meanders east through a beautiful thick forest and joins up with the pleasant and babbling Hunters Brook. (The trailhead is actually outside the park boundary, but you will see the NPS marker soon into the hike.) The trail follows the brook south and in no time you will be standing at Little Hunters Beach, a cobblestone beach with beautiful ocean-tumbled rocks that range in size from large boulders to small egg-sized stones. Also interesting is seeing the brook flow over and in between the rocks to make its way into the ocean. Return the way you came. 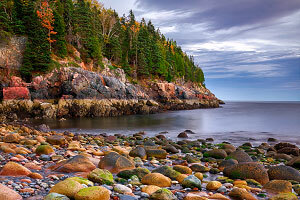 This is a great little family-friendly hike to a section of coastline where children of all ages will enjoy exploring and examining all of the different rocks. The more adventurous can also explore up the Hunters Cliff Trail, a trail outside the park boundary that heads into the cliffs west above Hunters Beach Cove.